Some conservative lawmakers in North Carolina want to kill the state's clean energy program, but a study released this week suggests they would be delivering a blow to a still-recovering economy and struggling consumers. The N.C. Sustainable Energy Association (NCSEA), an industry lobby group, commissioned an economic analysis of clean energy policy in the state, which was the first in the Southeast to adopt a Renewable Energy and Energy Efficiency Portfolio Standard (REPS). The study was conducted by RTI International, a North Carolina-based research nonprofit, and La Capra Associates, an energy markets consulting firm headquartered in Massachusetts. Among the findings was that North Carolina's REPS is an important driver of clean energy development, which in turn has been a job creator for the state, which currently has the nation's fifth-highest unemployment rate. The study also found that North Carolina's clean energy policies have been a net revenue generator while leading to lower electricity rates for consumers. In addition to the REPS, the study also looked at the state's renewable energy investment tax credit and the Utility Savings Initiative, which promotes energy conservation in public buildings. "This report is a clear indicator of the direct and indirect positive impact clean energy is having on North Carolina's economy and workforce, as well as generating additional state and local tax revenues," said Betsy McCorkle, NCSEA's director of government affairs. * Despite claims from opponents that clean energy is more expensive than polluting sources, North Carolina's clean energy policies are actually leading to lower costs for consumers by avoiding the construction of costly new power plants. 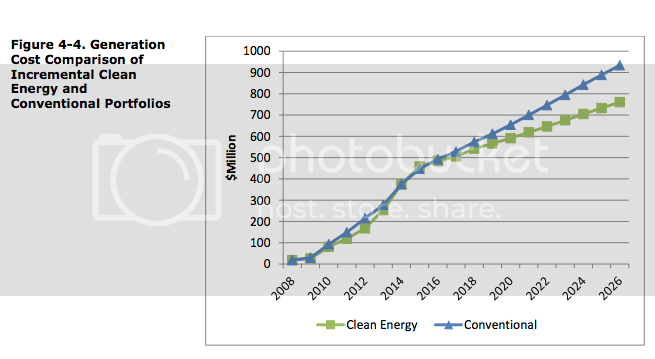 By 2026, the state's clean energy program will have resulted in a total of $173 million in cost savings for electricity customers (see following graph from RTI/La Capra study). * Tax credits used by renewable energy projects developed in North Carolina between 2007 and 2012 generated $1.87 in state or local revenue for every $1 of incentive. Since 2007, the state’s clean energy policies have netted the state $113 million in revenue. * Between 2007 and 2012, clean energy investment in North Carolina increased 13-fold and generated or saved an estimated 8.2 million megawatt-hours of energy through a combination of renewable energy and energy efficiency projects. At the same time, state government energy efficiency programs saved an estimated $427 million in taxpayer money. * Over that same five-year period, the total economic benefit of clean energy development in North Carolina was $1.7 billion and generated $2.56 billion in associated spending in the state's economy. North Carolina is one of 29 states that have adopted REPS laws. But those policies are under attack nationwide by conservative advocacy groups and politicians, including leaders in North Carolina's Republican supermajority-controlled General Assembly. Spearheading the effort to repeal North Carolina's REPS law is state Rep. Mike Hager (R-Rutherford), chair of the House Public Utilities Committee. He says he's motivated by a conservative belief that government shouldn't subsidize industry. Adopted in 2007 with overwhelming legislative support, North Carolina's REPS law currently requires the state's electric utilities to supply 3 percent of their retail sales from renewables and efficiency, with that portion set to increase to 12.5 percent by 2025. Hager wants to freeze the requirement at the current level. Hager worked for 17 years as an engineer with Duke Energy, the Charlotte-based utility giant, though he has since left the company. Both he and his former employer are members of the American Legislative Exchange Council, a corporate-funded network that promotes pro-business state legislation and has pushed for the overturn of renewable energy laws through its model "Electricity Freedom Act." However, Hager's effort is complicated by the fact that both Duke and Progress have stated for the record that they support North Carolina's clean-energy law. Now merged, the companies have given Hager $14,500 for his last two election bids, according to a recent Greenpeace analysis. Hager also appears to be at odds with North Carolina Gov. Pat McCrory (R), who has called for an "all of the above" energy policy that includes renewables in the mix. Last month McCrory -- also a former Duke Energy employee -- wrote a letter to the federal Bureau of Ocean Energy Management that said an energy plan including wind was "vital to a prosperous energy future" for the state. The agency is evaluating commercial interest in wind farms off North Carolina's northern Outer Banks and Cape Fear. The National Renewable Energy Laboratory has estimated that offshore wind could create as many as 10,000 jobs in North Carolina and bring $22 million in new economic activity. McCrory has declared that creating new jobs is the top priority of his administration.